Brown spots on your bonsai leaves are not only unsightly; they can result in permanent injury to your tree. They are your bonsai’s way of indicating a problem, and by the time your bonsai develops brown spots, the ailment that's causing them has already introduced itself. The upside is, in most cases, brown spot on bonsai leaves can be eliminated and then prevented in the future. Leaf spot is a common cause of brown spots on bonsai leaves. This fungal disease is spread by spores that infect the bonsai’s foliage. It initially appears as very tiny spots that enlarge as the disease progresses. This diseases is generally confined to the foliage of the bonsai but will cause dieback of stems and branches if left untreated. Bacterial leaf spot can also result in brown spots on fungal leaves, though this disease is less common for bonsai. Similar to fungal leaf spot, it travels by bacterial spores that infect the leaves of the bonsai. Other diseases such as powdery mildew, botrytis blight and verticillium wilt can also cause brown spots on bonsai foliage. Bacterial leaf spot differs from the others because, if left untreated, the infection can spread onto the stems, branches and trunk of the bonsai. Insect infestation is another common cause of brown spots, resulting from wounds that are caused by the insects as they feed on the foliage. Though the small bites will not cause death of the entire leaf, the bitten area will decay and die. Bonsai leaves that have developed brown spots must be pruned away. These leaves cannot be revitalized. However, a combination of pruning and chemical treatments will help the bonsai develop new, uninfected foliage. 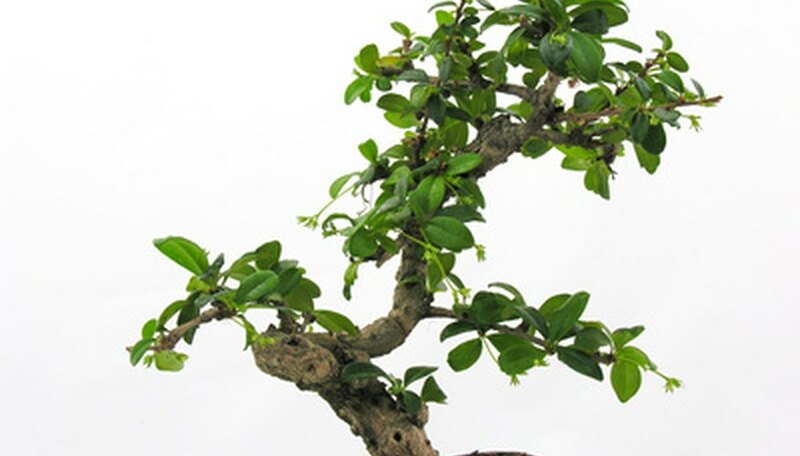 Chemical treatments should come in the form of fungicidal, bactericide or insecticide spray treatments that you select based on the bonsai’s individual ailments. Many local nurseries and home improvement retailers carry the needed products. The best way to prevent brown spots on bonsai leaves is to keep your bonsai healthy. Bonsais that receive a balanced amount of nutrients, water and sunlight will maintain a vigorous growth rate with a strong root system. Healthy bonsais are better prepared to fight off potential dangers. Bonsai owners should also include scheduled fungicide and insecticide treatments when there is constant threat of disease and insects.